Dangerous Money is a 1946 American film directed by Terry O. Morse, featuring Sidney Toler as Charlie Chan. This is the second and last appearance of Willie Best as Chattanooga Brown, the cousin of Charlie Chan’s usual chauffeur, Birmingham Brown (Mantan Moreland). 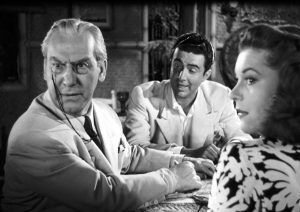 Aboard an ocean liner in the South Pacific, US Treasury agent Scott Pearson confidentially asks Charlie Chan for help. There have been two attempts on his life. Chan rescues him from a third, but not the fourth (a knife in the back). The captain asks Chan to complete the dead man’s mission and find out who is responsible for the recent surfacing of counterfeit dollars and stolen art. Chan declines, citing urgent business in Australia, but sets out to find the murderer. The film entered the public domain due to the omission of a valid copyright notice on its original prints.